Festival Budaya (means culture festival) is known as the biggest and oldest cultural event in Universitas Indonesia. Held by the students of Faculty of Humanities, this event brings carnival, theater, and installation competitions, as well as a music concert, each year. It is the only event in which you can find a theater performance marathon in a day by 15 different study programs, which is incredible! If you are in the town during November/December, don't miss the vibe! kindly go to the event, it's totally free, and totally worthy! It was my honor to have an opportunity to take a role in the 31st Festival Budaya as a man behind the designs. With Puji Rahajeng, the one and only partner in the division of design, I tried to create a visual identity fitting the theme, which is fairytale. And this is it! After some revisions, we got this font as the logo. I made this font serif and bold to represent the firmness and strength of a kingdom, which we think is a basic element of every fairytale. Personally, this is one of my favorite fonts, especially for the letter S. Feel free to download it here and don't forget to give a good feedback if you like it. 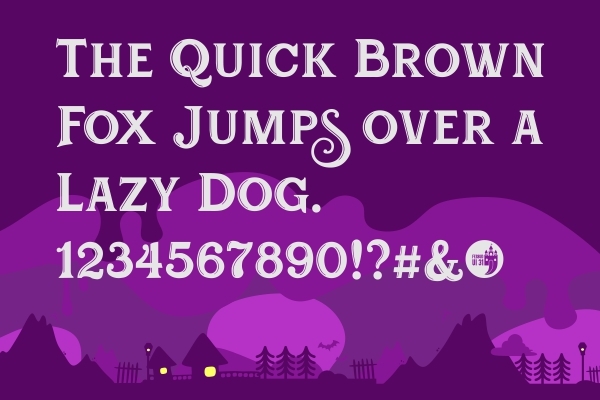 I LOVE this font! I used it for a logo for a friends honey farm. Sent a donation..Love it will be making a sign with this! it's gorgeous! You have some really awesome fonts! I'm only using non-commercially, but after reading your FAQ's, I was struck by how generous and kind you are with people using your fonts when they're just starting a business up or, for example, use for non-profit projects, I'll be making a donation when I get paid! You deserve it, not only for your creations but also for being a great person! Good luck with all you do! I love all your fonts, you do great work!